ST. PETERSBURG, Fla. - Oliver Gavin and Olivier Beretta sailed to their second consecutive GT1 class victory of the season on the waterfront street circuit in St. Petersburg, Fla. The two Ollies had a smooth run to the American Le Mans Series winner's circle in their No. 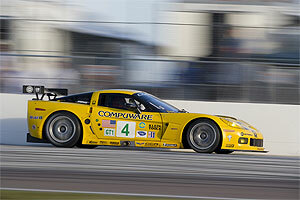 4 Compuware Corvette C6.R after a driveline problem sidelined the No. 3 Compuware Corvette C6.R of Johnny O'Connell and Jan Magnussen. "It was a very strange race today, but as usual my Corvette, my crew and my teammate were perfect," said Beretta, who extended his record for ALMS career victories with his 30th win. "It was very important to stay out of trouble. There was a lot of traffic ahead and behind, and I had to always be careful of the walls. There were quite a lot of things to deal with at once, but that is all part of sports car racing." Gavin and Beretta completed 111 laps of the 1.8-mile temporary street circuit, finishing eighth overall. The race pace was slowed by five caution periods. "The restarts were very tough," Gavin reported. "The tire temperature dropped quickly when we were behind the pace car and there was a lot of rubber pickup. Some of the GT2 cars were very quick on the restarts so I just had to let them go. I just tried to drive within myself, and on several laps I found I needed to pick up the pace to keep my concentration up and maintain my focus. You can't ever let up on a street circuit." 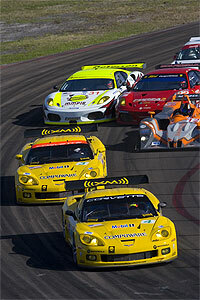 The two Corvettes were within a second of each other until the first caution period began at 46 minutes into the race. The pole-winning No. 4 Corvette had a slight advantage when O'Connell's car suddenly slowed on the course just as Beretta made his first pit stop for fuel, four Michelin tires, and a driver change. "When I got in the car I was unsure what was happening with our sister car, and I just drove a rather lonely race," said Gavin. "The No. 4 Corvette was flawless, and it performed extremely well." With no power going to the rear wheels, O'Connell was forced to park his Corvette after completing 37 laps. The No. 3 Corvette did not complete 70 percent of the overall winner's total laps, so under ALMS rules O'Connell and Magnussen were not eligible for championship points. "It's very rare for Corvette Racing to have a mechanical problem, but over the past few years it seems the No. 3 Corvette has had the bad luck," said O'Connell. "It's tough for Jan and me because this race could ultimately decide the championship. Even if there are only two cars in the race, you want to be a competitor. The only thing that will make this feel better is if we have good luck at Le Mans." "This is a very unusual situation for us, but that's the reason we're out here racing," commented Corvette Racing program manager Doug Fehan. "We'll look at the parts, see what the issues are, address any problems, and make the cars more bulletproof. There's something to be learned from this, and that's what we'll do." Corvette Racing's next event is the second of three consecutive street races, the Grand Prix of Long Beach on Saturday, April 14. The 1-hour, 40-minute race on a 1.968-mile temporary street circuit will begin at 7 p.m. ET (4 p.m. local time), and will be televised in a same-day broadcast on the SPEED Channel from 8 to 10:30 p.m. ET.